Database.Net 26.4.6940.1 Portable » TopFreeSoft.Net - Best Freeware Software! Database .NET is a simple and intuitive database management tool for multiple databases, making local and remote database administration easier. 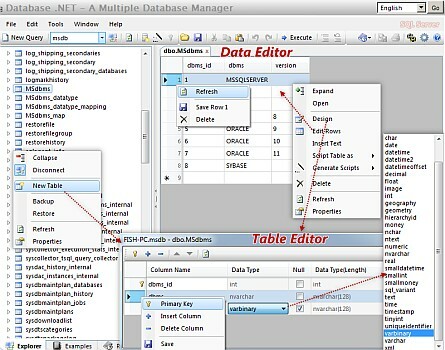 With it you can Create databases, Design tables, Edit data, Export data, Generate scripts and run SQL queries. A standalone tool that does not require installation. Create, Shrink, Protect Database. Export to CSV/XML/TXT/XLS/SQL. Syntax Highlighting. Table Editor. * ... and much more. Dynamic Syntax Highlighting: Automatically switch the syntax highlighting dependant on exclusive database system.